WICHITA, Kan. – It took all of the 40 minutes in regulation, but the No. 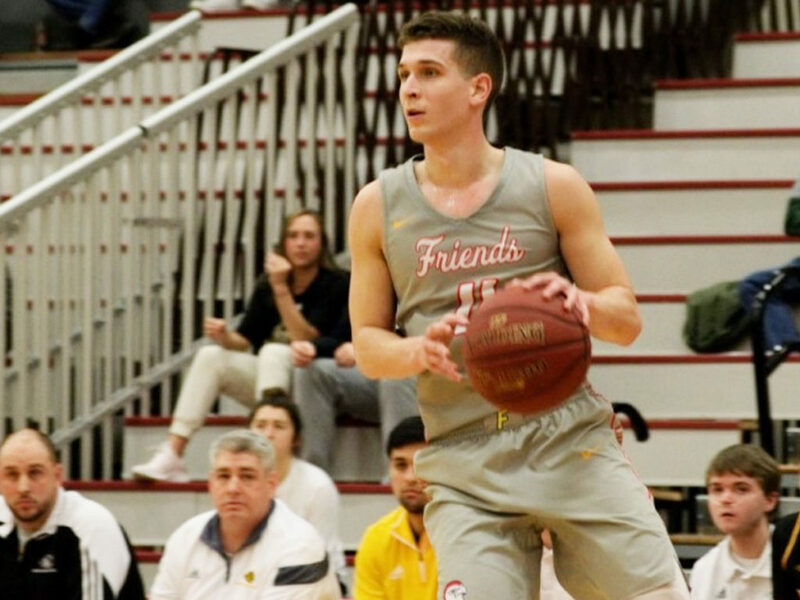 22-ranked Friends University Falcons held off the Bethany College Swedes, 94-92, for their 20th win of the 2018-19 campaign tonight (Feb. 7) inside the Garvey Center. The Falcons are 20-7 overall and remain locked in the third spot in the KCAC with a 16-6 league record. A putback by Vernon Vaughn (SR/Kansas City, Kan. ) and three by James Conley (JR/Derby, Kan. ) snapped the ninth and final tie of the game and gave the Falcons an 86-81 lead with 2:23 left. The Falcons would lead the rest of the way, but would have to hang on until the final seconds. Friends grew the lead to six twice during the final two minutes and was still up five with 24 seconds remaining when the Swedes made things interesting. A three by Tyler Larkin cut the lead to two and following one free throw from James Conley, Larkin was fouled shooting a three, but made just two at the charity stripe to make it a one point game with 10 seconds left. After Jordan Murdock (SR/Wichita, Kan.) split a pair at the line, Mitchell Brown had a good look at a potential game-winning three-point attempt, but his shot was short as time expired to allow the Falcons to hang on for the win. Murdock started fast in his final regular season home game, scoring 13 of the Falcons’ first 18 points. The Swedes kept pace and twice built an eight point lead, with the last occasion coming on a score from Lavaris Duncan that made it 35-27 at the 5:19 mark of the opening half. Murdock scored the next five points for the Falcons and seven overall to lead an 11-2 charge to give Friends its first lead since the 9:52 point. Luke Evans (FR/Wichita, Kan. ) would then answer a three by Reed Stephens with a trey of his own with nine seconds left to send the game into a 43-43 gridlock at the break. The Falcons gained some separation in the early part of the second half when Atir Cherne (SR/Wichita, Kan.) drilled a corner three to cap a 16-4 burst and give Friends its biggest lead of the night, 59-50 with 13:27 left. But as was the case much of the night, the Swedes found a way to hang in as eight points from Duncan and a pair of threes by Isiah Saenz fueled a 16-6 spurt and put Bethany back in front by one with 8:25 remaining. Murdock wound up with a double-double of 34 points and 11 rebounds for the Falcons and also dished out a team-high five assists. Cherne also played well in the final regular season home game of his career, scoring 20 points and hitting a career-high 70 percent (7-of-10) from the field. “Atir had a giant second half offensively and Jordan was consistent on the offensive side in both halves,” Faber said. Vaughn, also playing in last home game of the regular season, added 19 points for the Falcons and made a career-high tying nine-of-13 field goals. Duncan also put in a double-double to lead the Swedes, scoring 34 along with 10 boards. Larkin had 22 points, while Saenz scored 15 and recorded a game-high 10 assists. Both teams shot well from the field, with the Falcons knocking down 52.3 percent (34-of-65) from the floor and the Swedes shooting at a 51.4 percent clip (36-of-70). The Falcons outrebounded the Swedes 38-35 overall that led to a 48-36 edge in points in the paint and a 19-8 advantage in second chance points. 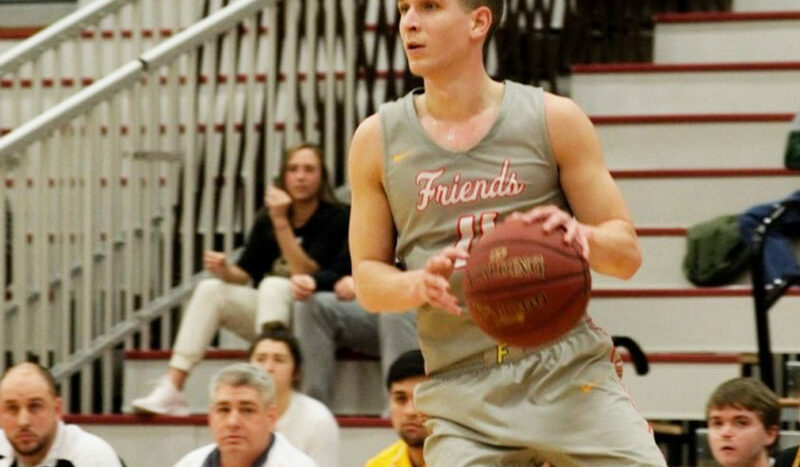 Friends will now play at Bethel College next Wednesday night (Feb. 13) at 8 pm in North Newton, Kan. The Falcons won big over the Threshers in the first meeting of the year, 88-65 in Wichita (Jan. 5). “We don’t play again until Wednesday of next week at Bethel, so we better make some improvements,” Faber said.